Signifying the Local offers a close examination of a wide range of cultural products from Mainland Chinese television, film, music, and literature that draw on local languages and dialects (方言). Drawing on theories from sociolinguistics, cultural studies, media studies, and literary analysis, the book illuminates the complexities of China’s cultural-linguistic landscape, one that is simultaneously infused with the central, official, standard, normalized Putonghua Mandarin, and a rich variety of peripheral, marginal, and local voices in both official and unofficial spaces. 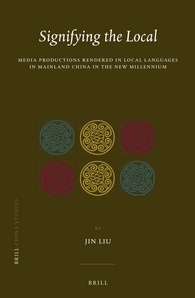 The book is composed of a theoretical introduction, followed by a historical review of local languages in China (chapter 1), as well as three chapters that focus on television (chapters 2, 4 and 5), three on film (chapters 3, 7 and 8), one on Internet music (chapter 6), and one on contemporary literature (chapter 9). Liu’s introduction provides an overview of state restrictions on the use of local languages in mainstream cultural texts, the continuing significance of the local, and the value of pluralism. It introduces the key term “方言” (lit. regional speech) and discusses the complexity of defining these “nonstandard local languages and dialects” (1) in the mainland Chinese context. Liu explains her focus on local languages as a way of interrogating the “multivocal and marginal identities” (7) that exist in China despite the commonly assumed depiction of China as unified and homogenous. She also links the study of locality to that of globalization, stressing how each interpenetrates the other. The chapter also explains her focus on the neglected genre of comedy and addresses the role of the audience. Chapter 1, “A Historical Review of the Discourse of the Local in Twentieth-Century China,” provides a detailed historical understanding of the notion of dialects and local languages in China going back to the late Qing, highlighting the significance of the May Fourth Movement and the National Forms Debate. Chapter 2, “An Overview of Television Series Productions in the 2000s,” canvasses activities in China’s major regional TV production centers, including Beijing, Shanghai, Chongqing and Chengdu, and Guangzhou. Liu highlights in particular the rise of TV series since the 1990s that have incorporated a Northeast Mandarin dialect. In addressing official policy, Liu notes that, despite the 2005 regulations stipulating the use of standard Putonghua, shows such as Zhao Benshan’s comic sketches in the CCTV Spring Festival Galas and telenovelas aired on CCTV1 have continued to feature characters who speak in dialects and have been especially popular. She provides a particularly interesting discussion of how formats of successful sitcoms have been re-produced and re-packaged with local actors from other localities (much in the same way that shows produced in other countries, e.g. “Ugly Betty,” have sold formatting rights to be re-made for audiences in other nations). Chapter 3, “Alternative Translation: Performativity in Dubbing Films in Local Languages,” considers dubbing as an alternative form of translation, and as a reaction against the tradition of dubbing from other languages and dialects into Putonghua. It examines the social and economic significance of the creative dubbing of both foreign and Chinese films into local languages. With a focus on a variety of programs, including cartoons like Tom and Jerry, it explores how the use of local humor and crowd-sourcing of local-language dubbers enhances a sense of local identity through the pleasure of recognition. It also considers the significance of creating dialect-versions for children in a context where dubbed versions in local dialects often contain crass language and sexual references. Liu also discusses the fear aired by some conservatives that the viewing of such programs will undermine the ability of children to acquire Putonghua. Chapter 4, “Empowering Local Community: TV News Talks Shows in Local Languages,” examines the rise of news talk shows in local languages. The laid-back approach, focus on local news and soft news stories, use of commoners as news anchors, and the blending of news with traditional entertainment forms from the area, also comes in opposition to the serious Mandarin news programs with their highly trained anchors. She explains that such shows have been popular among local audiences and economically lucrative for local television stations, which are always looking for a point of difference to attract audiences. Chapter 5, “Ambivalent Laughter: Comic Sketches in CCTV’s Spring Festival Eve Gala,” examines the interpenetration of central (high, official, elite, state-sanctioned) and local (low, popular, vulgar) discourse on one of China’s most popular and most highly controlled entertainment programs, the annual CCTV Spring Festival Gala. Through analysis of “comic sketches/short skits” (小品), particularly those of famous comic actor Zhao Benshan, Liu examines tensions between central, official, Putonghua and peripheral folk discourse, highlighting how the local both conforms to and subverts the central. Liu relates this phenomenon to Bakhtin’s theory of carnivalesque folk humour discussed in his work Rabelais and His World (1968) and the notion of “grotesque realism” in which the “forbidden” and the “low” and “dirty” that is usually excluded in official discourse emerges in that very discourse as both “triumphant” and “mocking” (122-3). In demonstrating how Putonghua is both multi-accented and plural (127), the chapter highlights the limitations of official discourse (137, 141). Liu also provides an interesting historical background to comic sketches in the Gala, tracing its evolution from Putonghua-speaking urbanites towards the language of “lower” rural peasants who speak with a distinct accent (124-126). She argues that the folk element has been included to show that the state has not forgotten China’s heritage in the era of modernization. Chapter 6, “Popular Music and Local Youth Identity in the Age of the Internet,” offers a nuanced account of the intersections between localism, nationalism, and globalization in youth culture, examined through the lens of local language songs on the Internet. Starting from the Internet sensation Xue Cun’s “The Northerners are all Living Lei Fengs,” she discusses how dialects are used by youth as a way of standing out in a context where Putonghua is seen as “too common, general and amorphous” (180), and as a way of distinguishing their identity from music from Taiwan and Hong Kong (169). The chapter compares rock music, which uses local languages “to signify a marginal outsider identity”, and the music of urban rappers, who use regional vocals to celebrate their local, urban roots. With compilations made on home computers, the Internet has become an “unofficial space where youth can “voice their discontent, frustration, and rebellion against their parents’ culture and hierarchical systems” (151), through, for instance, the use of expletives and discourses forbidden in school (165). At the same time, online productions also often celebrate and express pride in local identities (Shanghai Wu dialect/identity being a particularly active example) while negotiating with mainstream conceptions of national identities in ways that may “overlap” with government positions (185). Furthermore, the Internet is also full of parodies that poke fun at the very official culture with which young artists may simultaneously be involved (153). Liu also canvasses youth engagement in self-censorship and assesses the limits on how far young people will push the boundaries, particularly when producing their work for a wider audience or for commercial purposes (163). Chapter 7, “The Rhetoric of Local Languages as the Marginal: Chinese Underground and Independent Films by Jia Zhangke and Others,” examines films “produced outside of the state studio system and its ideological censorship” (188). Such films tend to focus on the underclass and marginal characters in contemporary China and engage amateur actors. Liu explores how local dialects are often used in these films not so much as authentic markers of place, but rather as aesthetic markers of marginality and a fragmented society. As in other genres, profanities in local languages are also used to represent further resistance to the national language regulations that apply to mainstream films. Liu also examines how the various uses of Putonghua and local languages represent stratified layers among disaffected youth, through their symbolizing of attempts at and/or lack of interest in upward mobility. She also considers the paradox that though these films aim to showcase the lives of subalterns, they cannot be shown publicly in China because they have not been submitted to the censors and are generally accessible only to cultural elites in big cities and to international audiences. Some analysts have criticized such films for the way they exoticize and commodify the underclass for the pleasure of elites and for presentation in contexts where the “banned” or “underground” are marketable labels. Chapter 8, “Multiplicity in Mainstream Studio Films in Local Languages,” examines the use of dialects in so-called “main-melody” (主旋律) films. Such officially supported films saw a reduction in the use of local dialects (once used to portray revolutionary leaders in Socialist China) after the implementation of a national language law in 2001 and a regulation by the State Administration of Radio, Film, and Television in 2005. Yet, the chapter highlights that despite official regulations, dialects have nonetheless returned to commercial entertainment films. Many mainstream films, especially comedies, have used dialects to portray the underprivileged and mark distinctions between “the urban and the rural, the insider and the outsider, and the little characters and the big shots” (219). Some have used dialects to tap into specific local or translocal markets, whereas others have used local languages to portray particular mentalities and subjectivities. Chapter 9, “The Unassimilated Voice in Recent Fiction in Local Languages,” examines the use of local languages and Putonghua in nativist fiction and educated youth fiction (知青小说). Nativist fiction describes a style in which writers experiment with writing in local languages and in doing so use rustic, rural language and ideas to critique a modern, urban culture exemplified by Putonghua. It also represents a challenge to the influence of Western and popular Hong Kong and Taiwan (港台) styles that have influenced Chinese writing since the 1980s. The genre also presents itself as a critique of the Enlightenment discourse that entered Chinese literature with the May Fourth movement of the early twentieth century. In this context, Putonghua is presented as “hollow,” “exaggerated,” and “overpolitical,” while local language helps to present a “purer” Chinese flavor and, significantly, assists such writers as Mo Yan (e.g. in Sandalwood Stake [檀香刑, normally translated as Sandalwood Death]) to establish a distinct style (259-260). Other works like Jia Pingwa’s Qin Opera (秦腔) aim to record memories of the fast disappearing rural life and express despair at the apparent incompatibility of modern and traditional culture (262). The section on educated youth fiction concerns works that feature “sent-down youth” who were dispatched to rural areas in the 1960s and early 1970s. The Putonghua of urban youth is contrasted with the local rural accents, which are generally much less respected. In some works, local languages of the sent down youth are condemned, which causes these migrants to lose aspects of themselves (e.g. The Sent Down Girl 秀秀, a film adaptation of Yan Geling’s novella of the same name). In others, sent-down youth may be pre-occupied with trying to transform locals by encouraging them to adopt the “higher” cultural forms (e.g. Balzac and the Little Chinese Seamstress). Liu demonstrates how some works focus on the language of the sent-down youth and ignore locals (e.g. Foliage 美人草), while others attempt to negotiate urban and rural identities (e.g. To Separate the Sheep from the Goats 把绵羊和山羊分开), where the main character attempts to assimilate into the local culture and adopts the local language with all its uncouthness, but is finally brought back to her urban, intellectual roots (252). Sent-down youth were expected to integrate (结合) with local people (267), but the works discussed reveal tensions and an inability to fully connect no matter how hard the characters may try. Putonghua is presented as a strategic language used to gain rewards (e.g. free train tickets) and to express proximity and empathy with other urban characters (275). It is also revealed as somewhat “fake,” given that sent-down youth often have their own local accents, and this is sometimes revealed in their “poor” or “shaky” Putonghua. It is also sometimes presented as a barrier to communication, because many locals do not understand it. Liu’s monograph offers an impressive and extensive analysis of the place of dialects and local languages in modern China through analysis of a wide range of media and texts. It debunks the myth that mainstream media is monolithically Putonghua. Throughout the book, Liu links China-focused literary analysis and case studies to a variety of international contexts, making the work relevant to scholars working with similar themes outside of China. The inclusion of Chinese characters intermingled with English facilitates this cross-disciplinary goal, and contributes to the book’s interrogation of the oneness of language. Overall, the monograph is comprehensively researched, drawing on English and Chinese-language academic and cultural research as well as interviews with singers and bands. This is also reflected in the extensive footnotes. The work must be praised for its scholarly attention to detail. I highly recommend it for scholars and students with an interest in sociolinguistics, languages and media, social power and the use of language among different social and ethnic groups, and those interested in understanding the pluralistic reality of contemporary Chinese culture, a vision that contrasts with official PRC discourse and with what some China commentators would have us believe.